I had the most delicious scalloped potatoes the other night, and was musing on how it happened that this delectable mélange of potatoes and dairy had the same name as an elegant shellfish, not to mention a classic way to cook veal. The best scallops I have ever had were in Nova Scotia, medium sized nuggets from Digby Bay which had a sweet, almost nutty flavor. And every restaurant sampled knew how to cook them properly, seared on the outside and barely warm on the inside. First, they tend to be fresher and tastier because they are hand harvested and suppliers charge a super premium price for them, rushing them to market. Whether ‘diver’ or not, look for ‘dry’ scallops which means they were not soaked in a brine after being shucked at sea and cruising for days, absorbing water along the way, which dilutes the flavor. Second, the harvest doesn’t disturb the sea floor and other denizens of the deep like mechanical dredging does. 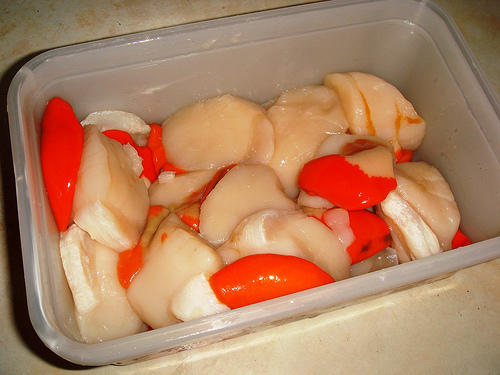 Most scallops in the market are labeled sea (big) or bay (small). There are occasional delights such as Cape scallops or Nantucket Bay scallops whose season is just finishing. Nantucket Bays were listed on the menu at the wonderful Le Bernardin last week, but the waiter explained that they were not available, their season over. Ever curious, I asked New Wave Seafood in Stamford about this, and was advised that no, the season’s not over, but close, and what’s available is astronomical in price. I guess even Le Bernardin has to “86” some items from time to time to avoid serving molecular size portions or adding impromptu surcharges. What we call scallops have much more interesting names in French and Italian. 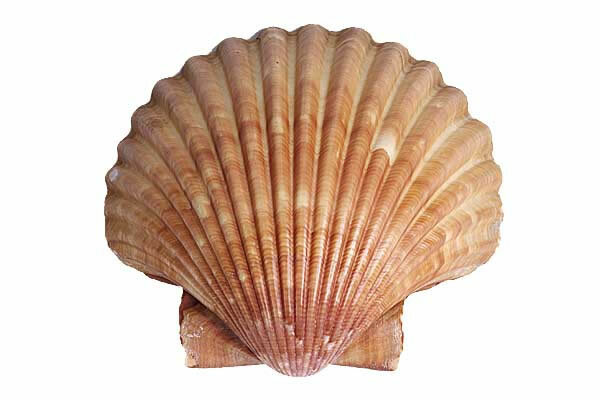 The scallop shell was the insignia for the Order of Saint James in the middle ages, related to the legend that he had miraculously saved the life of a king, who emerged from the sea covered in scallop shells. Pilgrims to Santiago (St. James) de Compostela in Spain were recognizable by the scallop shell they wore on their capes or cloaks. Hence, the French refer to them as Coquilles St. Jacques (shellfish of St. James) and the Italians as cappsante (capes of the saints). When you encounter scallops in French markets, the pretty pink coral is usually attached, making for an even more attractive and tastier dish. Here in the U.S., you’ll rarely see the coral, with the rare exception of some diver scallops. The reason for this ties to the ocean ride most of our scallops take before coming to market; the coral is more perishable then the muscle, and doesn’t hold or ship well. And one last word on scallops. Does anyone remember the myth that cheap scallops were really meat punched out of skate? Anyone who has ever eaten skate knows that it is yummy, but that neither the flavor nor the texture is remotely similar to scallops. Good story, very interesting. I believe there is the word escaloper, meaning to wrap around. That leads to shell, scallop and on.